No matter how well we look after our hands and nails - they are exposed to more free radicals and pollutants than any other part of our body. We might wear a film of make-up on our faces which can give protection, but washing, antibacterial gels full of chemicals, and everyday pollutants take their toll on our hands. So what's this wonder-ingredient CoQ10? CoQ10 is championed in scientific circles for reducing the signs of ageing; you can take it as a supplement and/or apply directly onto your skin. Knowing how good CoQ10 is, we think it's best to take the supplement and use the creams! CoQ10, known as ubiquinone or coenzyme Q, is a naturally occurring enzyme in our body and it works to neutralize free radicals. Basically it 'zaps' the bad guys - it stops free radicals from injuring skin cells and damaging our DNA one of the primary causes of ageing. Free radicals come in many forms, cigarette smoke, alcohol, chemicals & pollutants and they trigger a damaging chain reaction - which is why your hands and nails need extra help and protection to neutralise their ageing effects. Ageing can also take its toll on our nails too - they can become brittle and flake. That’s where this unique formula also gives a helping hand - by strengthening and moisturising the nail bed for stronger more beautiful nails. Try it - you'll be amazed at the difference and the improvement. Vitamin E for a rich skin food. 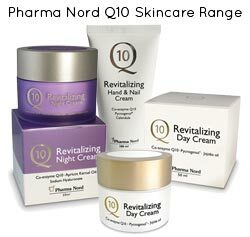 Coenzyme Q10 contains pycnogenol with bio-flavonoids to support your natural skin repair. Suitable for all skin types, and all ages too. Aqua, Paraffinum Liquidum, Glycerin, Calendula Officinalis Flower Oil, Caprylic/Capric Triglyceride, Cetearyl Alcohol, Glyceryl Stearate, Pinus Pinaster Bark/Bud Extract, Ubiquinone, Ginkgo Biloba Extract, Aminomethyl Propanol, Carbomer, Ceteareth-12 , Ceteareth-20, Cetyl Palmitate, Ethyhexyl Glycerine, Panthenol, Perfume, Phenoxyethanol, Tocopherol.